Syrian security forces fired bullets and tear gas at tens of thousands of protesters across the country, killing at least 75 people in the bloodiest day of the uprising so far. Syrian security forces fired bullets and tear gas Friday at tens of thousands of protesters across the country, killing at least 75 people in the bloodiest day of the month-long uprising and signalling that the authoritarian regime was prepared to turn more ruthless to put down the revolt against President Bashar Assad. Among the dead were a 70-year-old man and two boys ages 7 and 10, Amnesty International said. In the southern town of Izraa, a man ran carrying the body of a young boy, whose hair was matted with blood from a gaping wound on his head, as another child wept and shouted, "My brother!" Footage of the scene was posted on the protest movement's main Facebook page. The rallies, most marching out from mosques after Friday's noon Muslim prayers, erupted in towns and cities stretching along the breadth of the country, including in at least two suburbs of the capital, Damascus. The death toll was likely to rise, raising fears that there will be an explosion of violence Saturday as relatives bury their dead in funerals that in the past have turned into new protests. Ammar Qurabi, head of Syria's National Organization for Human Rights, said another 20 people were missing. Friday's toll was double that of the previous deadliest day of the uprising, on April 8, when 37 were killed around the country. The heavier crackdown came after Assad warned a week ago that any further unrest would be considered "sabotage" after he made the gesture of lifting long-hated emergency laws, a step he ratified on Thursday. "Bullets started flying over our heads like heavy rain," said one witness in Izraa, where police opened fire on protesters marching in front of the mayor's office. 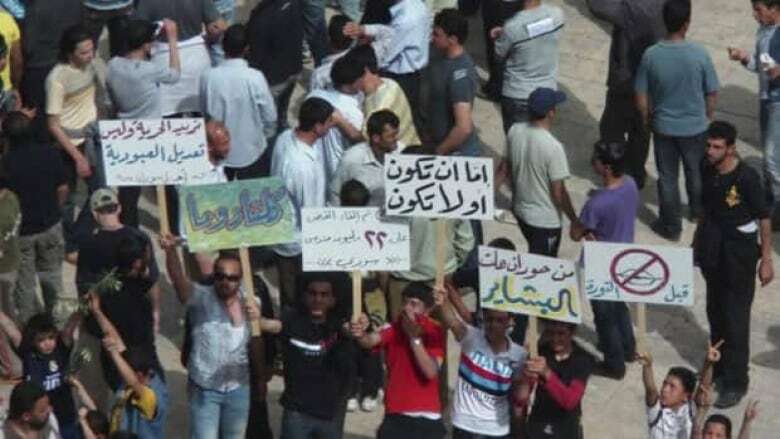 The town is located in southern Daraa province where the uprising kicked off in mid-March. In Washington, U.S. President Barack Obama condemned the latest use of force by Syria against anti-government demonstrators and said the regime's "outrageous" use of violence against the protesters must "end now." He called on Assad to change course and obey the will of his people by giving them what they seek — freedom of expression, association, peaceful assembly and the ability to choose their leaders. Amnesty International put the day's death toll at 75, mirroring reports from witnesses to The Associated Press. Friday's witness accounts could not be independently confirmed because Syria has expelled journalists and restricted access to trouble spots. Witnesses spoke on condition of anonymity for fear of reprisals. As it has stepped up its response, Assad's regime has seemed little affected by mounting international concern over the violence.